There is a Catholic radio station whose director and board members felt like the women in their listenership needed something new. 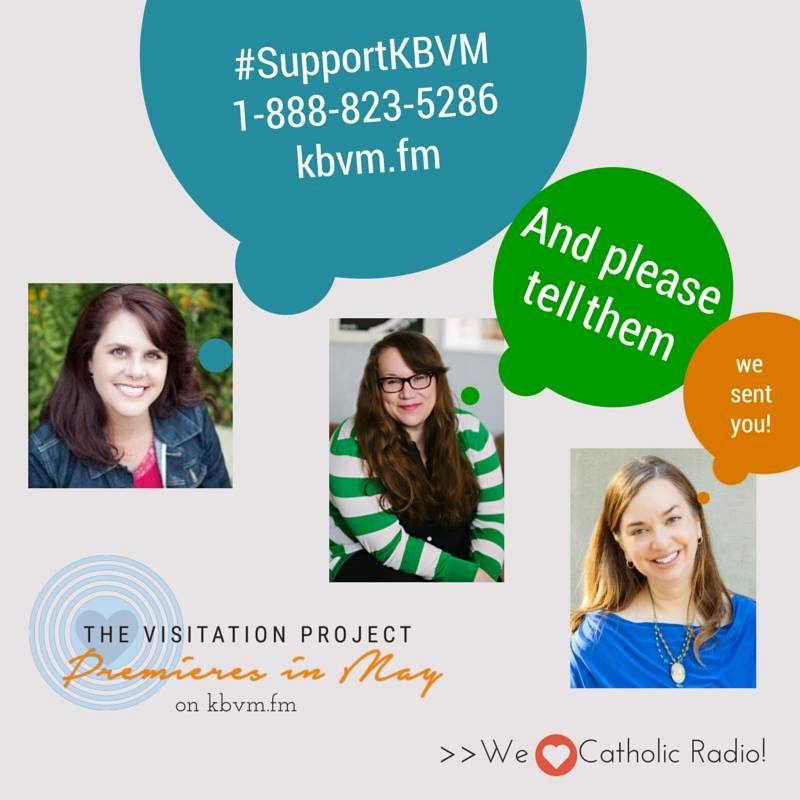 This station, KBVM, wanted a show that would meet women wherever they are, a show that would make them laugh, touch their hearts, build up their faith, and leave them feeling encouraged and renewed. Thus, The Visitation Project was born. The Visitation Project, co-hosted by Rebecca Frech, Heather Renshaw, and yours truly, begins airing on May 3rd. I know you haven't heard it yet so I know it's a bit preposterous to ask you to financially support KBVM, but I'm gonna do it anyway, and then I'll make it worth your while. KBVM needs to raise another $62,000 by the end of today, the last day of their share-a-thon. We can help them reach their goal. Call 1-888-823-5286 to make a pledge or visit www.kbvm.fm to make an online donation. $5, $10, $25, $80, $250, $1,000 - whatever you can do! And when you do, be sure to tell them that The Visitation Project sent you! - a free copy of Rebecca Frech's best-selling book, Teaching in Your Tiara. - a guest post slot on Shoved to Them, Rebecca Frech's blog with over 40,000 hits a month. This gift is worth over $110! Also, on top of the donation-earned entry, you can enter again by leaving another comment after you tweet, 'gram, or Facebook about the giveaway. Make sure you use the hashtag #TVPPrizePack and even better if you use the graphic above. The KBVM share-a-thon ends tonight at 7pm Pacific (that's 8pm Mountain, 9pm Central, and 10pm Eastern), which is when this giveaway will also end. We've got SIX HOURS! UPDATE: Exciting news, friends! KBVM is closing in on its overall funding goal yet still needs to raise the rest of the cash. So, for the rest of this weekend, they will be accepting donations (online only) that may be credited to the Spring Share-a-thon. This means we at TVP will be extending our fantastic #TVPPledgePack giveaway deadline to Sunday night! 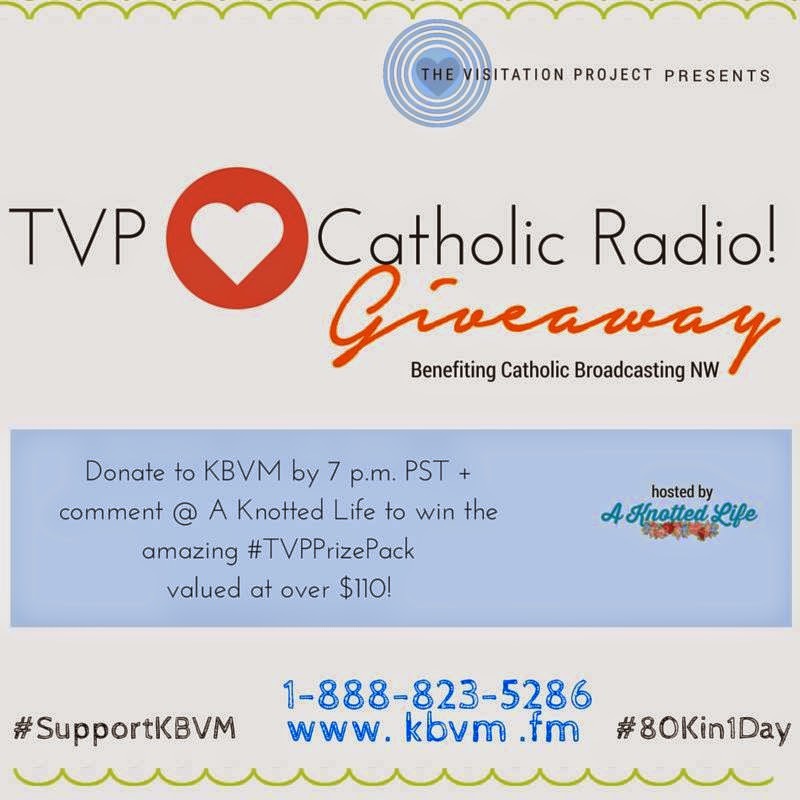 Visit www.kbvm.fm to donate and then comment and share to enter. Thank you so VERY much to all who have so generously given in support of Catholic radio! We love you!" And thank you so very, very, very much for your support, financially, prayerfully, and emotionally. God bless you and your generosity! And tweeted, and FB'ked on the blog page and personal page! Donated!!! Can't wait to hear you all!! Donated! Can't wait to hear you guys! Donated! Love KBVM and love TVP! I donated! And wish you girls all the blessings in the world. When hubby and I worked at IHR, I lamented that there was nothing for mamas!! And after we left, and I found the wonderful Blessed Is She community, I kept thinking, "Someone should really find a way to get some of these people on the radio!" :) yay for you gals and saying yes to the Holy Spirit!! tweeted! could you add another possible prize? Conversation with Women would just love to be mentioned or endorsed on your blogs! Yes I know, beggars can't be choosers. Donated. Wishing you all the best with your radio show! Donated! I sure hope you all met your goal!